Taste test: These medium-width rippled chips had a tangy flavor that tasted good, with a taste remotely like a flame-grilled steak, heavy on the onion. The chips were thick and had a pretty good crunch. Smell test: Nice tangy smell, but not particularly barbecue-like. 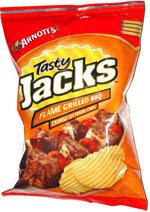 This snack was discovered by Nancy in Australia. Review published .